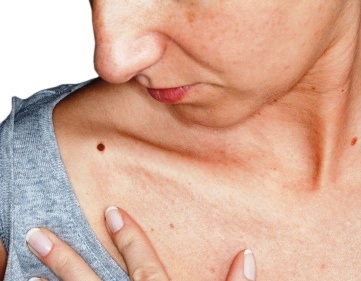 Melanoma has a genetic component. If you have a family member who has had melanoma, you have 50% greater chance of developing melanoma and should be checked once a year. Wear sunscreen with zinc and at least SPF 30 every day. You are exposed to the sun’s rays simply driving in your car and walking by windows at home or work. The best sunscreens contain zinc oxide. This ingredient will protect you from both UVA (aging rays) and UVB (burning rays) radiation. Avoid the sun between 10:00 AM and 4:00 PM. Try to stay under an umbrella or shade trees. Use waterproof sunscreen at the pool or beach. One adult should use 2 tablespoons of sunscreen. A family of four will go through one and a half 8 oz bottles of sunscreen in two days. Wear a wide-brimmed hat to protect your scalp, face, and neck. Wear protective clothing. If you can see through a shirt when you hold it up to the light, it will not protect your skin from the sun.